Toward the end of 2000, when Saddam Hussein's skimming from the oil-for-food program for Iraq kicked into high gear, reports spread quickly to the program's supervisors at the United Nations. Oil industry experts told Security Council members and Secretary General Kofi Annan's staff that Iraq was demanding under-the-table payoffs from its oil buyers. The British mission distributed a background paper to Council members outlining what it called "the systematic abuse of the program" and described how Iraq was shaking down its oil customers and suppliers of goods for kickbacks. When the report landed in the United Nations' Iraq sanctions committee, the clearinghouse for all contracts with Iraq, it caused only a few ripples of consternation. There was no action, diplomats said, not even a formal meeting on the allegations. Since the fall of Mr. Hussein, the oil-for-food program has received far more scrutiny than it ever did during its six years of operation. Congress's General Accounting Office has estimated that the Iraqi leader siphoned at least $10 billion from the program by illicitly trading in oil and collecting kickbacks from companies that had United Nations approval to do business with Iraq. Multiple investigations now under way in Washington and Iraq and at the United Nations all center on one straightforward question: How did Mr. Hussein amass so much money while under international sanctions? An examination of the program, the largest in the United Nations' history, suggests an equally straightforward answer: The United Nations let him do it. "Everybody said it was a terrible shame and against international law, but there was really no enthusiasm to tackle it," said Peter van Walsum, a Dutch diplomat who headed the Iraq sanctions committee in 1999 and 2000, recalling the discussions of illegal oil surcharges. "We never had clear decisions on anything. So we just in effect condoned things." As recently as February, the official position of the United Nations office that ran the program was that it learned of the endemic fraud only after it ended. But former officials and diplomats who dealt directly with the program now say the bribery and kickback racket was an open secret for years. In blunt post-mortem assessments, they describe the program as a drifting ship - poorly designed, leaking money and controlled by a Security Council that was paralyzed by its own disputes over Iraq policy. The program, created in 1996, was an ambitious attempt to keep up international pressure on Iraq to disarm while helping the Iraqi people survive the sanctions imposed on the Hussein government after its invasion of Kuwait in 1990. The entire effort was financed by the sale of Iraqi oil. A political compromise allowed Iraq to decide to whom it would sell its oil and from whom it would buy relief supplies. It was up to the United Nations to make sure that the price Iraq set for the oil was fair and that the proceeds were buying relief goods, and not being funneled to Mr. Hussein's coffers or being used for illicit arms. As the flow of money ballooned, the United Nations, with an annual budget of just $1.5 billion, was responsible for collecting and disbursing as much as $10 billion a year in Iraqi oil revenues. Even as the fraud engineered by Mr. Hussein's government became widely understood, the officials said, neither the Security Council nor United Nations administrators tried to recover the diverted money or investigate aggressively. The work of the Office of the Iraq Program, which administered the oil-for-food activities, and of its former director, Benon V. Sevan, is the focus of an independent United Nations investigation headed by Paul A. Volcker, the former Federal Reserve chairman. His panel is looking into the broader charges of mismanagement and corruption in the program, as well as specific accusations that United Nations officials, including Mr. Sevan, took kickbacks. Mr. Volcker announced in a news conference on Monday that his panel would need at least $30 million and probably a year to determine whether the charges are justified. Despite an elaborate system in the United Nations for overseeing oil-for-food contracts, corruption never seemed to be the chief concern of anyone involved. The United States and Britain were focused on keeping material related to illicit weapons out of Iraq. Other nations that had greater financial stakes in Iraq, including France and Russia, favored lifting the sanctions. And for the United Nations bureaucracy, diplomats said, the priority was keeping goods flowing to the Iraqi people. In the halls of the United Nations, the program became a battleground for the competing commercial interests and political agendas of the 15 individual nations that made up the Security Council, diplomats said. Those same nations made up the Iraq sanctions committee, which took action only by a consensus that could be blocked by any member. The result was a paralysis that translated into acquiescence toward matters like oil kickbacks. Annual reports of the sanctions committee reflect the limp reaction to repeated signs of corruption. For instance, at a meeting in 2002, an annual report said, the sanctions committee "considered a report from the Islamic Republic of Iran on the interception of an alleged oil-smuggling attempt in its territorial waters," adding, "The committee took note of this information." When the committee learned from a press report in late 2001 of allegations that an Indian company was helping Iraq purchase embargoed materials for a nuclear fuel plant, the United States and Britain pressed for an investigation. Two committee members said the panel debated for months whether to urge India to investigate. "Discussions on the matter remain inconclusive," the committee said in its 2002 report. While the diplomats were deadlocked over how to address violations of the sanctions, money and contracts continued to flow through the Office of the Iraq Program. Mr. Sevan, the Cypriot who headed the program, has denied that he received any kickbacks and would only say in a statement that his office was not responsible for ferreting out corruption. Congressional investigators this year disputed that claim, citing United Nations resolutions. Evidence of fraud passed from office to office in a round robin ending nowhere. A former State Department official who was part of an interagency committee that reviewed trade contracts with Iraq said the group detected "abnormalities in pricing that suggested fees and kickbacks." The former officials said the committee "asked why Iraq needed to import gilded tiles for palaces, or liposuction equipment." Peter Burleigh, who was the deputy American representative to the United Nations in the late 1990's, said those concerns had been relayed to Mr. Sevan's office. Mr. Sevan's office said it had passed information regarding suspicious contracts to the sanctions committee, on which the United States held a permanent seat. Even after the committee received reports that suppliers were padding their contracts to hide payoffs, the committee never rejected a contract because of cost, according to recent Congressional reports and former United Nations officials. Mr. Sevan's chief interest was to avoid deadlocks over relief supplies, said Michel Tellings, one of the three oil overseers who monitored Iraq's oil sales for the United Nations. "Benon saw that he had a divided Security Council in front of him and was more concerned about getting the food in and the oil out," Mr. Tellings said. "So he took a middle way and didn't investigate problems. He'd say, 'If you've got clear evidence, I've got to go to the Security Council. If it's a rumor, don't bother.' "
The lack of coordination in the program was evident in the fact that while United Nations auditors produced 55 reports on the program over the years, several diplomats on the sanctions committee said in interviews that they never even saw them. In the end, a complicated set of political and financial pressures kept the program ripe for corruption.Mr. van Walsum, the retired Dutch diplomat, said he sometimes suspected that his fellow diplomats were disinclined to hear about potential fraud because they were concerned about protecting the interests of friendly companies and foreign allies eager to trade with Iraq. "Everyone," he said, "was living in the same glass house." The oil-for-food program was established to get food and medicine to the Iraqi people and to counter Mr. Hussein's claims that sanctions were solely responsible for the widespread malnutrition in Iraq after the embargo was imposed in 1990. Iraq was not prohibited from buying food and medicine; it just was not using its money for that purpose. By modifying the oil sanctions, the Security Council wagered that it might gain enough leverage to force Iraq to buy more relief goods. On one level, the program worked well. According to Congress's General Accounting Office, the program provided food, medicine and services to 24 million Iraqis. Malnutrition rates for children fell. But along the way, the Security Council approved provisions that opened the program to corruption. Mr. Hussein agreed to the program in 1996 only after winning a major concession: While the United Nations would control oil revenues, Iraq could negotiate its own contracts to sell oil and to purchase supplies. That arrangement, according to the General Accounting Office, "may have been one important factor in allowing Iraq to levy illegal surcharges and commissions." Then in 1999, the Security Council removed all restrictions on the amount of oil Iraq could sell. And the Office of the Iraq Program was given power to approve contracts for a range of items - food and medicine, agriculture and sanitation equipment - without approval from the Council's sanctions committee. Meanwhile, the United States and Britain were delaying the approval of billions of dollars in contracts that they feared would provide Iraq with material or equipment that could be used for the development of weapons of mass destruction. Those "holds" on contracts deeply concerned the United Nations officials trying to improve Iraqi living conditions, and drew objections from members of the Security Council that favored a freer flow of commerce with Iraq. Countries that supported the continuation of sanctions came to see the relief aid side of the program as secondary. As Mr. van Walsum put it, "oil for food meant oil not for W.M.D. " Facing pressure from other nations, the United States and Britain agreed to further compromises in the sanctions system. Under Security Council resolutions and the oil-for-food program, all of Iraq's oil revenues were to be paid into a United Nations bank account to be used for relief goods. But Iraq's booming trade in illicit oil continued under the eyes of the Council. Iraq's suppliers included Russian factories, Arab trade brokers, European manufacturers and state-owned companies from China and the Middle East. In one instance, American officials in Iraq found, Syria had been prepared to kick back nearly 15 percent on its $57.5 million contract to sell wheat to Iraq. And some of the world's biggest oil traders and refineries did business with Baghdad, including Glencore, a Swiss-based trading company. Different Security Council members had different levels of tolerance for the abuse, said Mr. Tellings, the former oil overseer. When the United States and others wanted the sanctions committee to confront Syria on oil sales, they were blocked by Russia and France, which argued that Syria should not be singled out when the Americans refused to investigate Iraq's equally lucrative oil trade with their allies, Jordan and Turkey. Congressional investigators have estimated that Iraq collected $5.7 billion from selling oil outside United Nations supervision, while the oil-for-food program was chronically short of money for relief supplies. "They could have done a cost analysis of at least what Saddam was selling to Syria," said Hans von Sponeck, a longtime United Nations diplomat who resigned as relief aid coordinator for Iraq in 1999, "and then ask Iraq for a credit to the oil-for-food program because there was never ever money enough for the minimal needs of the people." John D. Negroponte, then the American ambassador to the United Nations and now to Iraq, defended the special treatment given to Jordan and Turkey that let them pay Iraq directly for oil either in cash or barter goods. Both countries were suffering economically from the sanctions, he told a Senate committee this year. He demurred when asked by Senator Christopher J. Dodd who benefited from the unsupervised oil sales. But the senator said he had few doubts. "Wouldn't it be a pretty good guess," he said, "that they probably ended up in the pockets of Saddam Hussein and his cronies?" Mr. Dodd asked. Mr. Negroponte replied, "I just don't know, sir." The Hussein government demanded kickbacks on almost every contract it negotiated, beginning in 2000, according to documents from Iraqi ministries obtained by The New York Times this year. Senior Iraqi leaders ordered ministries to notify companies that they had to pay an amount equal to 10 percent of the contract value into secret foreign bank accounts, a violation of the United Nations sanctions. To do so, Iraqi officials said, suppliers would deliberately inflate the prices of their goods. On a $500,000 contract for trucks, for instance, Iraq would tell the supplier to prepare a contract for $550,000, with a side agreement promising to transfer the $50,000 add-on to an Iraqi-controlled bank account. A shakedown plan of such magnitude - $33 billion worth of goods were ordered by Iraq from mid-2000 until the American-led invasion last year - did not go unnoticed. "When the 10 percent came in, companies came and asked us what to do," said Jacques Sarnelli, who was the commercial counselor of the French Embassy in Baghdad at the time. "We said it's illegal, you do it at your own risk, we don't want to know about it, and we are against it." From his vantage point, he said, pinpointing evidence of a kickback would have been difficult. "It was a shadow part of the business," he said. At United Nations headquarters in New York, diplomats said the officials administering the program were more concerned about relief supplies. Mr. Sevan, who headed the Office of the Iraq Program, repeatedly appealed to the sanctions committee to speed up contracts for equipment, food and other goods. Mr. Sevan's office was supposed to examine the contracts to ensure price and quality. But it was "unclear" how it fulfilled that responsibility, according to the General Accounting Office. At the sanctions committee, news of the systematic 10 percent kickback scheme prompted some public hand-wringing. Some diplomats, reacting to news reports, said they wished, but did not expect, companies to come forward and provide information. Ole Peter Kolby, a Norwegian diplomat who succeeded Mr. Van Walsum as chairman of the sanctions committee, expressed hope for "hard evidence," but then added, "I guess also companies that do that are not likely to tell anybody." At one point, the sanctions committee outmaneuvered Mr. Hussein on the illegal surcharges the Iraqis levied on every barrel of oil. In late 2000, the oil overseers relayed complaints by major oil companies that were buying from Iraq. After the committee debated for months about what to do, the United States and Britain pushed through a change in the way Iraq's oil was priced, bringing it more in line with world prices and drastically reducing the margin for fraud. But no attempt was made to recover the surcharge payment or to investigate which companies paid. "You couldn't ask the committee for guidance because you'd never get an answer," Mr. Tellings said. "It was nobody's responsibility." The problem with the United Nations was that its charter was too idealistic. It didn't have the built in checks and balances necessary to be effective. In fact, its charter was designed to be taken advantage of, and the only checks and balances built in was the veto power of the Allied powers in the Security council. Why did we give veto power to France anyhow? They were a defeated nation. Annan in historic meeting with Supreme Court &Congress/is believed to be unprecedented. The members of the security Council of the U.N. are the allies Kerry is still waiting to join us? He'll be able to schmooze these thieves into joining the coalition? Kerry, Kofi Anon and Chirac are weasels. I bet Kerry, Kofi, and Chirac are really three stooges. They probably have a secret club where they get together and drink wine, and plan the fall of America. I question the timing of the Slimes' release of this story on the day McGreevy announces he will resign. This may be on the front page (not posted yet) but nobody will read it. The U.N. was shocked - SHOCKED - to find out Saddam was taking kickbacks as the French, Germans, Russians and Kofi Annan's son were making out like bandits. Sure. Two of the "founders" of the United Nations were Agler Heiss and William J. Fulbright. Heiss was later proven to be a communist spy. Fulbright was a socialist and segregationist who would later mentor Bill Clinton. The UN is the league of nations with more power and more socialism. The sooner we get out, the better. I think the sooner we turn the United Nations head quarters into condos, the nicer the skyline will look. Mr. Sevan, the Cypriot who headed the program, has denied that he received any kickbacks and would only say in a statement that his office was not responsible for ferreting out corruption. But no attempt was made to recover the surcharge payment or to investigate which companies paid.... "You couldn't ask the committee for guidance because you'd never get an answer," Mr. Tellings said. "It was nobody's responsibility." >>>The UN is the league of nations with more power and more socialism. The sooner we get out, the better. After reading about the Heinz Foundation, I start doing searches on more Foundations. I came across this listing, http://www.antiguabarbuda.net/chm/finanresourc/fundingart20.htm to start with. The Capitol Mall, Washington, D.C. This is some scary stuff! And it seems very consistant with a lot of propaganda that always crossed over from Lisa Lasky's Jihad messages to the connections found in Twexus! My name is Dr. Len Horowitz, and some time ago, probably like many of you, I considered myself a lifelong liberal democrat. Fortunately, or unfortunately, that part of me died. When I realized the forces behind so-called liberal democracy were the flip side of the same corrupt coin as the republican political establishment, that is, I opened my eyes to witness a shadow government of military-medical-industrial dictators, the naive person I was had a stroke, keeled over, and praise the lord, died. And I didn't need to call Dr. Jack Kevorkian in to let it rest in peace. What brought me to this realization and this meeting today is a unique story. Six years ago, most of you can recall, the highly publicized case of the Florida dentist who infected his patients with AIDS--the case of, the beautiful teenager, Kimberly Bergalis, who died shortly after testifying before Congress in a wheel-chair. At the time I was serving as the chief professional advisor to the largest dental and medical catalog supply company in the world. The day the story broke I was assigned to develop patient and professional educational materials to help allay the public's growing fear of visiting dental and medical offices in the age of AIDS. You may recall how terrified most people became about a routine trip to the dentist at that time. So I began by investigating the Centers for Disease Control and Prevention's (CDCs) official investigation reports on the case. And to make a long story short, I found the reports to be scientifically bogus. I later learned that the government had covered-up key evidence in the tragedy in an effort the maintain the case a 'unsolvable mystery.' In essence they had committed scientific fraud and misconduct and, in the process, concealed the most incriminating evidence against the dentist--a very bright, scientifically trained, ex-military dentist, who believed he was dying of a virus that the government had created. Yes, you heard me correctly, a virus that the government had created. refractory to the immunological and therapeutic processes upon which we depend to maintain our relative freedom from infectious disease. . . A research program to explore the feasibility of this could be completed in approximately 5 years at a total cost of $10 million. . . . It is a highly controversial issue and there are many who believe such research should not be undertaken lest it lead to yet another method of massive killing of large populations." In fact it was the National Academy of Sciences-National Research Council (NAS-NRC) that had informed the Defense Department that this research was possible. Now, according to legal testimony given to government officials, this knowledge enraged the Florida dentist so much it moved him to intentionally inject his patients with HIV-tainted anesthetics. In essence, he did what all organized serial killers love to do, express a vendetta, like the mail-bomber, play games with the authorities, trap them in a catch-22, whereby they'd be damned if they told the truth, and called him a serial killer, because the whole world would want to know motive, and every reporter would ultimately find out as I did, what drove him crazy and who he really hated and ultimately attacked. And if they told a lie, or maintained the case, as they did, a mystery, it would hold America and all of health care hostage to irrational fear of routine health care in the age of AIDS. Now all of this I documented in three published scientific reports and my last book "Deadly Innocence: The Kimberly Bergalis Case--Solving the Greatest Murder Mystery in the History of American Medicine." I present these publications and documents here for your critical examination. So Dr. Acer created a crime, a mystery, that couldn't be solved, without implicating the government and causing a larger mystery to be investigated. That is, the origin of AIDS and Ebola--the subject of my last three years of research, and why I have come before you today. In fact, I investigated the Department of Defense's germ warfare appropriations request and learned that the option to develop synthetic biological agents--bioweapons as alternatives to nuclear weapons--came from Dr. Henry Kissinger, who was gradually placed in his position of authority as National Security Advisor under Richard Nixon, the most powerful man in government, by Nelson Rockefeller and his affiliates at the Council on Foreign Relations. Moreover, I traced where the money went. It went, in fact, to a firm called Litton Bionetics, a subsidiary of the mega-military contractor Litton Industries, whose President, Roy Ash, was being considered as an alternate to Henry Kissinger for the National Security Advisor post. Instead, Roy Ash became Richard Nixon's chairman of the Presidents Advisory Council on Executive Organizations, and 'Assistant to the President of the United States.' And Litton Industries was given over $5 billion in military contracts during the first term of the Nixon administration, $10 million of which went towards the development of AIDS-like viruses. A mere drop in the bucket. But before I tell you exactly what was done with your $10 million of taxpayer money, some background on Kissinger and Rockefeller's influence is in order. Among Henry Kissinger's most influential patrons as he worked his way up the ladder of success to become Nixon's 'Deputy to the President for National Security,' was Nelson Aldrich Rockefeller, the son of Standard Oil, that is Exxon, heir John D. Rockefeller, Jr. The Rockefeller family's involvement in the medical/industrial complex, health science research, and American politics is clearly important. Before World War II, major administration of medical research, or financing by federal agencies, had been generally opposed by America's scientific community. In fact, it was only during times of war that organizations like the NAS or the NRC received major funding. Both the NAS, established during the Civil War, and the NRC, set up during the First World War, were largely ignored in times of peace. Between 1900 and 1940, private foundations and universities financed most medical research. According to Paul Starr, author of The Social Transformation of American Medicine: The rise of a sovereign profession and the making of a vast industry, 'the most richly endowed research center, the Rockefeller Institute for Medical Research was established in New York in 1902 and by 1928 had received from John D. Rockefeller $65 million in endowment funds.' In contrast, as late as 1938, as little as $2.8 million in federal funding was budgeted for the entire U.S. Public Health Service. Therefore, it is easy to see that Rockefeller family investment in health science research predated, and far surpassed, even the federal government's. More than the New Deal, the Second World War created the greatest boom in federal government and private industry support for medical research. Prior to the war, American science and medicine was heavily influenced by German models. This precedent was bolstered during the 1930s when the Nazis purged Jewish scientists from German universities and biological laboratories. These changes, according to Starr, significantly altered the course of American health science and medicine. Many of Germany's most brilliant Jewish researchers emigrated to the United States just as the movement burgeoned to privatize war related biological and medical research. At this time, the Rockefeller led medical/industrial complex was fully poised to influence, and take advantage of, Congress's 'first series of measures to promote cancer research and cancer control.' In 1937, the new federal legislation authorized the establishment of the National Cancer Institute under the National Institutes of Health, and, for the first time, 'the Public Health Service to make grants to outside researchers.' The Rockefellers exercised significant control over the outcomes of these grants and research efforts through the foundations they established. Following the war, Henry Kissinger, who had become General Alexander Bolling's German translator and principle assistant (Bolling, of course, was the 'Godfather' to the Joint Intelligence Objectives Agency that ran "Project Paperclip," the secret exfiltration of approximately 2,000 high level Nazi's, about 900 of whom were military scientists and medical researchers, including Erich Traub, Hitler's top biological weapons developer and virus expert. Bolling also served as a high ranking member of the Inter-American Defense Board, a Washington based group that delivered Walter Emil Schreiber, Hitler's chief medical scientist, the "Angel of Death" Joseph Mengele, and his assistant, "the butcher of Lyon," Klaus Barbie, among others, to safe havens in South America where they worked on CIA projects.) In fact it was Henry Kissinger's job to seek and find such Nazi's that might be of service to America, and Kissinger became the chief of Army Counter-Intelligence in this regard. He trained other agents to hunt down Nazi's at the European Command Intelligence School in Oberammergau, not to be tried for war crimes necessarily, but rather to serve U.S. military rather than Russian interests. It was this operation that principally spirited the creation of the CIA as a cover agency for the powerful Gehlen Org, the German intelligence agency run by Reinhard Gehlen--an organization whose power superseded even the Nazi SS because of its prewar connections with German military intelligence. After Hitler, Gehlen served Allen Welsh Dulles, whose "Operation Sunshine" brought Nazis into the U.S. spy service. You may be interested to know who paid for the importation of Nazis into American central intelligence, the military, and industry? Three groups: The first was "The Sovereign Military Order of Malta" (SMOM), perhaps the most powerful reactionary segment of European aristocracy, that for almost a thousand years, starting with the crusades in the Twelfth Century, funded military operations against countries and ideas considered a threat to its power; Second was the Nazi war chest that was largely funneled through the Vatican and the Rockefeller owned Chase Manhattan Bank, whose Paris branch conducted business as usual throughout the Nazi occupation of France, and thirdly, some of us and our parents--American taxpayers. Moreover, during this period, the Council on Foreign Relations, along with the CIA, grew in power under the leadership of Nelson Rockefeller, and in 1955, while serving as President Eisenhower's assistant for international affairs, Rockefeller invited Kissinger to discuss national security issues at the Quantico (Virginia) Marine Base. Following their meeting, according to Walter Isaacson's biography of Kissinger, the diplomat became Rockefeller's 'closest intellectual associate,' and soon after, Kissinger authored several military proposals for Eisenhower to consider. Unimpressed, Eisenhower turned them down. As a result, Rockefeller sent Eisenhower his resignation and then launched a Special Studies Project that explored the 'critical choices' America faced militarily in the coming years. Kissinger agreed to direct this new project and published a 468-page book on his findings. The treatise proposed that tactical nuclear weapons be developed and 'a bomb shelter [be built] in every house' in preparation for limited thermonuclear war. 'The willingness to engage in nuclear war when necessary is part of the price of our freedom,' Kissinger argued. So those of you my age can recall the anxiety grade school students felt while drilling for possible nuclear attacks. You can thank Kissinger and the Rockefeller-led military-industrialists for this "price for freedom." Eisenhower, you may remember, warned America that the gravest threat to world security, democracy, and even spirituality, was the growing military/industrial complex. And the Rockefellers and Kissinger played leading roles in its evil expansion. Bent on creating what President Bush openly heralded as a "New World Order," few people realize the current international alignment of economic powers is a direct result of actualizing Henry Kissinger's contemporary manifesto--a tribute to the Sovereign Military Order of Malta--entitled "The Meaning of History." In this Kissinger 1955 Harvard doctoral thesis he argues that the concept of peace on earth is naive. Peace must be secured by the creation of small wars around the planet on a continuing basis so as to maintain an international order of economic powers, and of course, keep the military industrialists happy. In my latest book, "Emerging Viruses: AIDS & Ebola--Nature, Accident, or Intentional? ", I traced Dr. Erich Traub's movements to the U.S. Naval Medical Research Institute, where he conducted experiments on animals to determine the lethal doses of more than forty strains of highly infectious viruses. Within ten years, the Navy's Biomedical Research Laboratory, in association with the University of California, along with Litton Bionetics, became a chief supplier of viruses and cell cultures for NCI researchers throughout the world. Funding for this work was largely controlled by the NCI, Rockefeller and Sloan Foundations. A search through Sloan Foundation's annual reports, on file in Manhattan's New York Public Library, revealed nine ghastly and incriminating reasons that, most incredibly, tied all the elements of my "Emerging Viruses" investigation together. The Sloan Foundation: (1) supported black educational initiatives consistent with the COINTELPRO Black Nationalist Hate Group campaign (you may recall reports last year that in surveys of 1,000 Southern Christian African Americans, two-thirds reported their belief that the AIDS epidemic may be genocide, while one-third was convinced it was; (2) the Sloan Foundation administered mass-media-public-persuasion experiments completely consistent with the CIA's Project MKULTRA - efforts to develop brainwashing technologies and drugs to affect large populations; (3) funded much of the earliest cancer research involving the genetic engineering of mutant viruses; (4) began major funding of the National Academy of Sciences, Cold Spring Harbor Laboratory (for 'neuroscience' and molecular genetics research), the Salk Institute (for viral research), and the Scientists' Institute for Public Information between 1968 and 1970; (5) funded population control studies by Planned Parenthood-World Population, New York, N.Y.; (6) funded the Community Blood Council of Greater New York, Inc., the 'council of doctors' who established the infamous New York City Blood Bank which allowed more than 10,000 hemophiliacs and countless others to become infected with HIV because they allegedly didn't want to spend $150 million to screen the blood; (7) maintained Laurence S. Rockefeller, the director of the Community Blood Council of Greater New York- the international blood bankers - and the president of the Rockefeller Brothers Fund, as chairman of the board of the Memorial Sloan-Kettering Cancer Center, and a trustee for the Sloan Foundation; (8) gave in excess of $20,000 annually to the Council on Foreign Relations; and (9) maintained among its 'marketable securities,' 16,505 shares of Chase Manhattan Bank stock (in 1967, which it apparently sold by 1970 probably to avoid conflict of interest charges) along with 24,400Ð53,000 shares issued by Merck & Co., Inc. (the company whose President, George W. Merck, was director of America's biological weapons industry, and whose hepatitis B and polio vaccines most plausibly transmitted AIDS throughout the world). Also in "Emerging Viruses: AIDS & Ebola," you will learn exactly what was done with the $10 million Congress gave the DOD for the development of AIDS-like viruses, because I published the relevant contracts. You will learn that Dr. Robert Gallo, the famous NCI molecular biologist, pardoned by President Clinton last year for scientific fraud and misconduct, and credited with the discovery of the AIDS virus, set about to develop immune system ravaging, AIDS-like viruses, along with other Litton Bionetics researchers. You will learn that they took monkey viruses that were humanly benign, recombined them with DNA, RNA, and enzymes from other animal viruses that caused leukemias, lymphomas, and sarcomas, and then to get them to jump species, they cultured these new mutant viruses in human white blood cells in some studies, and human fetal tissue cells in other studies, to produce immune-system-destroying, cancer-causing viruses that could enter humans and produce virtually identical effects to what the AIDS virus is currently doing in people around the world. Indeed, it was contaminated live viral vaccines that spread this disease and likely others, including chronic fatigue, certain leukemias, and possibly Gulf War Syndrome as well, to vast populations. In fact, today's live viral vaccines, including the oral polio vaccine required by law be given to our children, are still littered with simian (monkey) virus contaminants since they are developed in monkey kidney cells, and the U.S. Food and Drug Administration turns a blind eye to as many as 100 live monkey virus contaminants per vaccine dose, and is barred from telling health professionals and even health scientists this truth because of pharmaceutical industry dictated proprietary laws and non-disclosure agreements. In the end, the research question I asked, "Did these viruses, AIDS and Ebola, evolve naturally, were they accidentally produced, or were they intentionally created and deployed?" I conclude, unquestionably, they are not natural. I leave you the reader, and concerned citizens of America and the world, to decide whether it was a horrible accident or treacherous covert population control experiment. I ask all of you to consider the pain and cost of the current and coming plagues, including the escalating rates of virus-linked cancers like prostate and breast cancer, certain leukemias and lymphomas, and other vaccine contaminant related illnesses including hyperactivity disorders in children and escalating sudden infant death rates. I believe you will realize that the pain and cost of denial and indifference to this horrible reality is far greater than the toll your political action might cost. I therefore urge you to join our growing grassroots network of health consumers, professionals, scientists, patriots, and concerned citizens in our search for answers and solutions. I urge you to help us pressure Congress for a full investigation of these published facts, and to allocate the funding needed to effect appropriate solutions to these urgent health care problems. Thank you very much, and God bless. After others have done the spade work, The Times pursues a favorite strategy: Publish a humongous article on the embarrassing subject (so you can't be accused of hiding the news altogether), then walk away from it. A drip-by-drip story presentation would hurt Democrat favorite-son and UN-francophile John F. Kerry. Hmmm. . .seems to me the ones who were involved in this corruption are the same ones Kerry wants to pander to in order to get their 'approval' before we take any steps to protect ourselves. 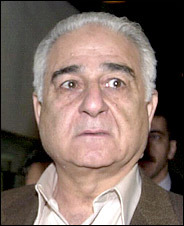 Caught in the headlights: Benon V. Sevan directed the U.N. oil-for-food program for Iraq. Not to mention Saddam Hussein, Kofi Annan, UN, Jacques Chirac, France, Russia, etc. I like that logo and the place it takes ya. Thanks!